Melt the chocolate and espresso powder, either slowly in a microwave or using a double boiler, until consistently full melted and smooth; set aside and allow to cool slightly. In a separate bowl, combine flour, baking powder, salt and cocoa powder; set aside. Preheat oven to 375°F. In a stand mixer, combine butter and sugars until light and fluffy. Add the eggs, one at a time, and mix until just combined; add the vanilla. Combine melted chocolate with mixture and beat until just combined. Gently mix in the flour mixture by thirds into the egg/sugar mixture, folding until well combined. On a parchment-lined cookie sheet, drop batter by the tablespoon-full. Bake for about 8-10 minutes (the cookies will still be slightly soft when they come out of the oven). Transfer the cookies onto a wire cooling rack and cool completely. Meanwhile, melt the Nutella until it reaches a spreadable consistency. 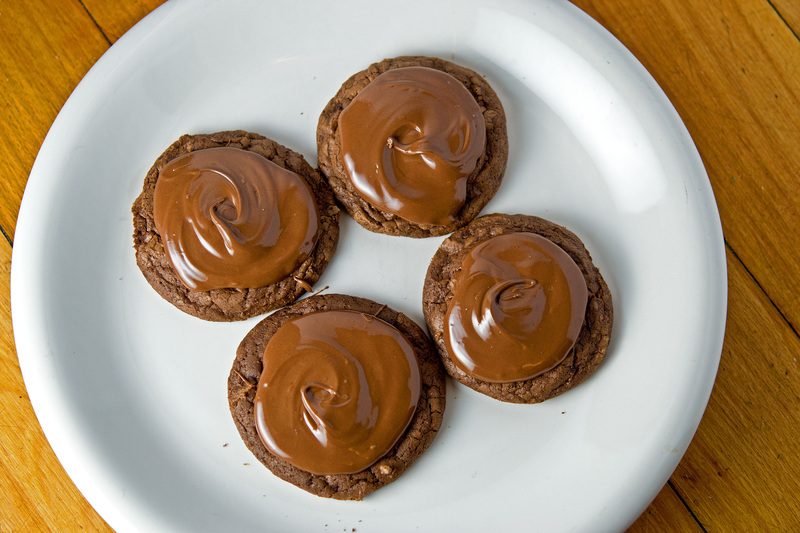 Swirl the top of each cookies with a large dollop of Nutella using a spoon. Serve immediately, or store in an airtight container. The first thing i would make with this mixer is the dough i would need to make my moms strufela. It is ltlite fried dough like balls that you put honey and holiday sprinkles on!! Its a tradition i have kept every holiday season since she passed away in 1994. This would so help me out i have wanted one of these mixers for about ummm ten years!!! Very cool! Let me know how those turn out – they sound delicious!